"Whatever we decide, it will never be right. We struggle with our colonial past. Which we must come to terms with. History does not change, but our view of it does. And everyone experiences that differently. That is why not everyone will approve of our future decision. 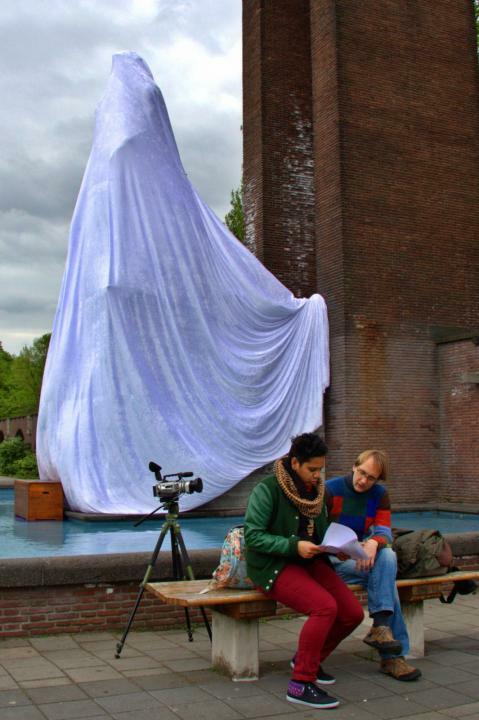 It is important, however, that the monument continues to confront us with the Dutch colonial past." That was the conclusion of van der Wieken, alderman of the Amsterdam Oud-Zuid district, during the public consultation evening on the 19th of September 2000, on which the future of the Van Heutsz Monument was debated. Seven years, and many committee meetings and public consultations later, the restored statue was finally unveiled again. This time as the Dutch-Indies Monument. The possibility to revise the original meaning of the sculpture appears to have been incorporated into its design by the artist Frits van Hall. "Take a crowbar," he is reported to have said to his pupil, "tear down the name of Van Heutsz and replace it with the letters Freedom, Merdeka, or Indonesia, and you have a Statue of Liberty." Now we stand before this monument, on Liberation Day. Three generations after the colonial statue was first unveiled. The basin of the fountain has been cleaned, and the graffiti erased. The bronze relief of Van Heutsz, which was removed from the base by unkown persons in 1984, has not been restored to its place. Three twisted bronze pins that once held it in place, are the only reminders of the vehemence with which the existence of this tribute was disputed. The numbers that refer to the birth and death of the controversial general have also been removed. Instead, six new dates have been chosen to represent the past. The proclamation of independence of Indonesia in 1945, and the transfer of sovereignty in 1949, are mentioned in the same breath as the town council's decision to change the name and function of the monument itself. Did these changes rectify a contentious historical error? Or did they take the sting out of it, leaving the work of art to confront us, like a modern-day Vanitas, with the fleetingness of the values we ascribe to it? Let's take heed of the words of the artist. For if the name of Van Heutsz can be torn down so easily, then, by the same token, so can words such as "Freedom", or "Merdeka". Principles and ideals are more volatile than concrete, brick or bronze. It is up to us to reaffirm again and again what this statue stands for. And if we cannot agree on that between ourselves, then let this site turn back into the battleground of yore, on which we settle our disputes. TAKE POSSESSION OF THIS EFFIGY.. TODAY Saturday the 5th of May 2012.. 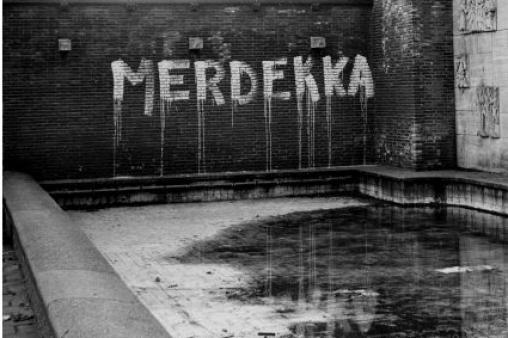 I DEMAND....MERDEKA for my PEOPLE on the MOluccas as well as here in the NEtherlands. Merdeka in the consideration of the human rights of our people, held by Indonesia..
Merdeka in the de reasoning of a MOluccan here in the NEtherlands ..
Merdekaaaaa in the sense of progress and activity of my interaction as 3rd generation MOluccan here in the Netherlands..
Merdeka is my info I provide about MOluccan history, through Moluccan Eyes..
Merdeka is the story I tell to the ignorant..
Merdeka is the combative spirit I glean from the Dutch cover-up..
Merdeka is the sanctimoniousness of the Dutch Government then and now, that does nothing for our people..
Merdeka is the reflection I take from the Moluccan Kepala Batu .. to look at oneself..
Merdeka is what I say.. MErdeka is what I feel .. MErdeka is my MOLuccan INterpretation of the HIstorical Word..
Merdeka is my respect for being here in this cold little country..
thanks to my GRandpa ex-knil-military..
Merdeka for all MOluccan EX- Knil Soldiers! !